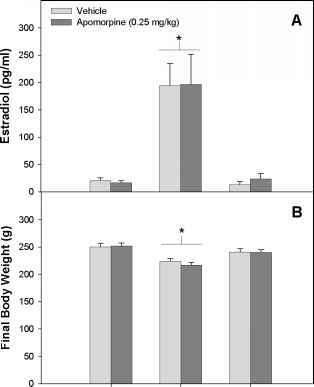 Plasma estradiol and body weight data are illustrated in Figure 1. Separate two-way ANOVA indicated significant main effects of Treatment Group on both plasma estradiol (F[2,52] = 8.62, p < 0.01; Panel A) and body weight (F[2,56] = 13.22, p < 0.01; Panel B). As expected, animals in the E2 group had significantly elevated estradiol levels compared to both E2/WD and Control groups (both p's <0.01). In addition to high circulating levels of estradiol, body weight was also reduced in the E2 group compared to both E2/WD and Control groups (both p's < 0.05). This finding is consistent with the previously reported anorexic effect of estradiol . As expected no effect of apomorphine on estradiol levels or body weight was observed. Figure 1. 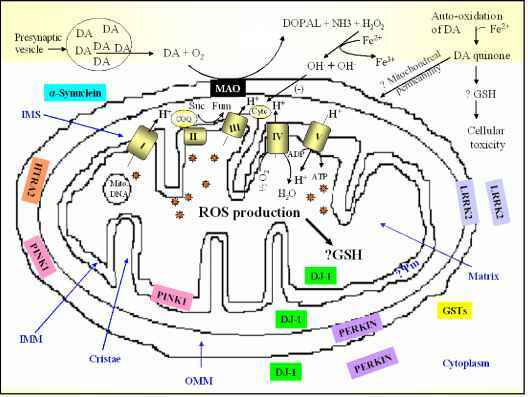 Effect of estradiol exposure on plasma concentration and body weight. Panel A: Data are mean (+SEM) plasma estradiol (pg/ml) for all experimental groups (n=8-11). Panel B: Data are mean (+SEM) body weight (g) for all experimental groups (n=8-11). * p < 0.05 vs. Control and E2/WD groups (collapsed across Drug condition).